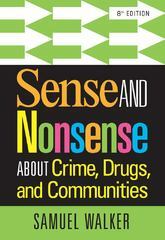 Sense and Nonsense About Crime, Drugs, and Communities 8 Edition Samuel Walker's SENSE AND NONSENSE ABOUT CRIME, DRUGS, AND COMMUNITIES was one of the first books to challenge common misconceptions about crime, and the new Eighth Edition remains uniquely effective at doing so. Described as a "masterful critique" of American policies on everything from crime control, to guns, to drugs, this incisive book cuts through popular myths and political rhetoric while emphasizing current research and proven practice. The result is a lucid, research-based work that clearly reveals what does not work in crime policy while identifying shared characteristics of successful approaches, including carefully defined, narrowly focused, problem-oriented programs in policing and prosecution. This engaging text captures the full complexity of the administration of justice while providing readers with a clear sense of its key principles and general patterns.